Connections are comprehensive and the rear panel, in stark contrast to the simplicity of the minimalist front, is crammed full of sockets of one kind or another. There are three pairs of balanced (XLR) inputs and two single-ended (RCA) ones. There is a balanced XLR line output too which can be used should you feel the need to go for a bi-amped set-up which would be fascinating. Speaker connections are a model of excellence as you can employ 4mm or spade terminals with ease and superbly solid connections. They are some of the best out there. To further enhance the amplifier’s versatility there are two optional modules available either on delivery or as a half-hour retro-fit by your friendly dealer. Vitus has an excellent reputation where DACs are concerned, and for around £2k you can enhance the possibilities of the RI-101 considerably by adding one. For £3k you have the option of adding a DAC / streamer. 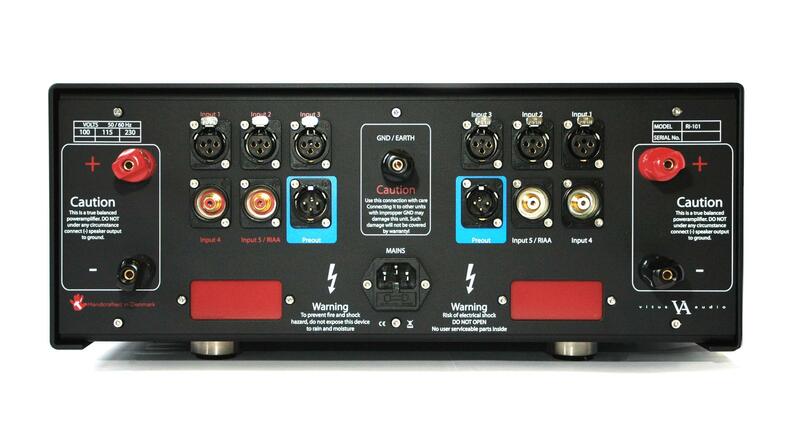 These include additional digital inputs and allow the amplifier to function as a digital hub. Now that streaming has really come into its own I can imagine many customers being very interested in this option. The review sample had not been fitted with these modules though. From the box, I thought the new Vitus to be rather flat sounding and quite dry, which I had anticipated. It was as powerful as expected and the promise of fine detail sitting atop a low-end of unusual power, and impressive grip needed several days to come together and a few weeks of musical work-outs before finally expanding into the joyous, muscular device that sits atop some Stillpoints as I write. Just have a bit of patience and it will come good as the whole scope and presentation of the amplifier moves to another level, the focus clicks into place, and the recorded ambience opens wider and wider. It’s about now that it really begins to flex its considerable muscles at all levels and gets to grip with really ‘driving’ the speakers. So, I am trying to learn the ‘Kid Charlemagne’ guitar solo (from The Royal Scam), played by Larry Carlton, courtesy of Tidal and the RI-101 has taken over amplification duties while a dCS Vivaldi DAC is giving it every musical chance to perform. Down in the basement of the song lurk Bernard Purdie and Chuck Rainey, the drummer and bass player, and I became entirely fascinated with the semi-shuffle pattern they are laying down. The Vitus has complete control over the song and the recording. Bernard is the master of doing everything while seeming to do very little. His little pushes and angular rhythmically hypnotic skips are really what drive the song and give it such a classy feel. The RI-101 punches this rhythm out, and the way that his very understated bass drum works with Chuck Rainey’s astonishingly precise bass guitar is nothing less than magical, bringing a really locked-in feel. This amplifier allows you to delaminate the song if you want. This is a rhythm section like very, very few others and I cannot think I have ever heard better. The sense of movement through time and the way that these guys bring their utterly superb skills to the song, with so little apparent fanfare, move it to another, timeless level. I love the way the Vitus resolves all these components and that the increases in resolution and quietness have been so brilliantly incorporated to the benefit of the music. It’s not so much the extra detailing of the instruments but more about highlighting the way that the instruments are being played for me. It is also very good at allowing you to easily follow each and every line while maintaining a clear view of the whole. As for the guitar solo? It is one of the greats in my opinion, but I’m still struggling with that one I’m afraid. The amplifier can swing a mighty 300 watts into 8 ohms and this, of course, is one of its significant features. As I asked earlier, who needs 300 watts? In my small room, I probably don’t, but that bottomless well of power makes itself felt even at modest levels to give a notable sense of ease to the dynamics. It’s that sense that you really need to hear to appreciate. Such a well of power is not only about volume. Add the increases in amplifier resolution and a purer sense of clarity to the rest of the onboard improvements, and you’ll realise that this has released the amplifier to open new musical details and subtleties and quite often, that’s where the magic lies. The bass delivery is excellent and even better when you realise how joined-up it is with the entire bandwidth. It is about as tight and grippy as I have heard, but there is not even the slightest hint of compression or any compromise in extension. Tonally it is superb too. Push the RI-101 and it will ask big questions of the whole system. Play some music with thunderous bass and some serious drive and the RI-101 shows what it is all about. I have spoken in the past at the way the Class A Vitus amplifiers have such a beautiful way of unfolding rhythms, tempos, and sheer pace and have often described them as being like a fast flowing river of movement. The improvements to this new amplifier suggest that the Class A setting is not wholly responsible for this. This Vitus is a driving, punching rhythm machine. It delivers timing emphasis with ease and has the speed of recovery to match its sense of impact and note shaping. I can’t help but feel that this comes under the general heading of resolution that I see as covering a lot more than instrumental or vocal detail. The vital way that Hans Ole’s products illuminate musical movement inevitably has something to do with the inordinate amount of care taken with the power supply in his amplifiers. Add the lower noise floor and the excellent leading-edge control, ask it to drive a system fully capable of responding to high-end musical demands, and the new amplifier seems to be a much more capable performer that operates at a higher level altogether than the model it supercedes.